Mystic of Holyhead (successor to Lynn Rival) - Open your eyes! On our way to Vitoria we had crossed another state border, leaving behind Rio de Janeiro, so we were in our 6th state since returning to Brazil. 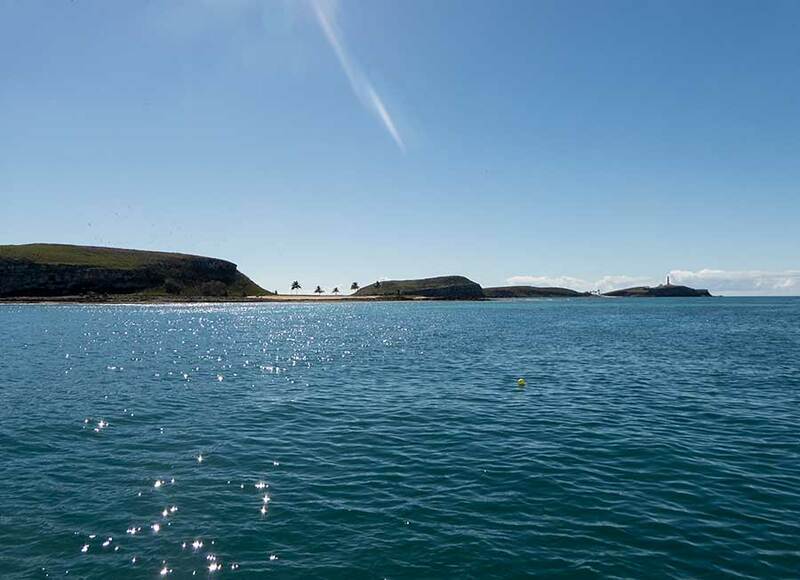 There are few good anchorages along the coastline of Espirito Santo, just beaches. Vitoria is the capital and the people here are called Capixabas, which our guide book says was "a former tribe". While at anchor on our first night in Vitoria we were approached by the owner of a nearby yacht - a local sailor who had learned English while living in Emsworth. He told us to beware of local thieves. Apparently a visiting yacht had had an outboard stolen, though he was vague about the circumstances and proceeded to leave his dinghy with outboard afloat all night - something we would never do! The following day we took his advice and moved onto the yacht club jetty. Having been here before we were content to relax and catch up with all the usual chores. There are numerous restaurants within walking distance of the yacht club so we indulged, our best meal being a Moqueca Capixaba (local stew) made with fish and prawns. The fish was obviously fresh from the nearby fishing harbour. And, although wine is expensive, the Brazilian national drink Caipirinha (sugar cane spirit with crushed lime) makes a good accompaniment. 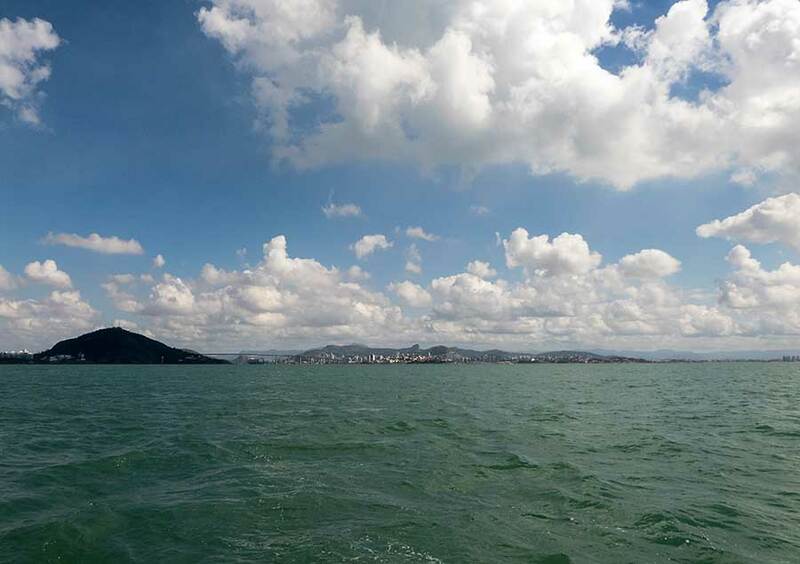 At 20 degrees south of the equator Vitoria is also a turning point for the sailing winds we encounter. Until now our passage-making has been subject to the frontal systems crossing the South Atlantic but now we are in the zone where the south east trade winds dominate. 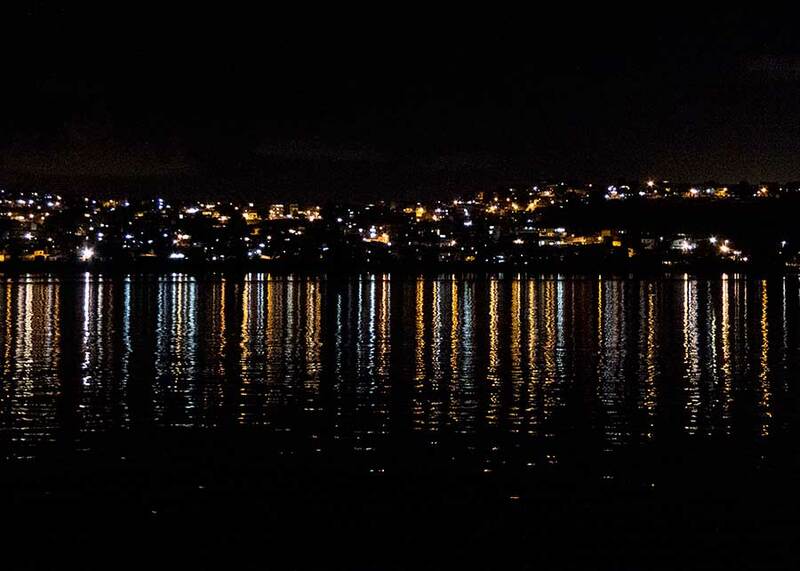 The average temperature is noticeably higher, only falling to about 24 degrees at night, as opposed to 20-22 around Rio, though not necessarily climbing much higher during the day. After four days in Vitoria we were ready to move on for our next adventure. Since returning to the east coast of Brazil our main objective has been to visit the Abrolhos Archipelago. Abrolhos is an abbreviation of "Abre os olhos", meaning open your eyes! This small group of volcanic islands and coral reefs, 30 miles off the coast, was a major hazard to the early explorers of Brazil. It was visited by Darwin (and no doubt Stephen Maturin) and, in 1983, was established as the first marine reserve in Brazil. The extensive coral reefs are popular for diving, with four times the number of endemic species compared to the Caribbean. The islands are a haven for seabirds and during July to October the surrounding seas are visited by humpback whales who come up from the Antarctic to breed. The anchorages at the Abrolhos are not comfortable in strong southerly winds so what we wanted was a couple of days of moderate southeasterlies (for both sailing and whale-watching), turning northerly on our arrival! It didn't quite work out like that. First of all we had a heart-stopping moment when we tried to start the engine. It wouldn't turn over. Paul soon discovered the problem: a dead engine-starting battery. We switched over to one of our two domestic batteries and - to our relief (or as Paul prefers 'to plan B') - it went. Once out of the harbour we set sail in moderate easterlies, beating our way offshore as best we could but, at times, having to tack back inshore to avoid oil installations. With a 1 knot current against us progress was slow. The following day we were gently sailing along when we started to see whales. At first the sight of these massive creatures sticking their heads out of the water, doing back flips and splashing their tails is a bit disconcerting but they were generally not too close. We were entertained the whole day by their antics. The next day was much the same, although the sea was a bit rougher. At one point we had two whales following in our wake, within a boat's length, obviously curious to see who we were. Rachel was concerned they'd catch our fishing line so pulled it in, only to find that we'd caught a fish - a blue runner - another free supper. By the afternoon we decided to motorsail in order to reach the Abrolhos by sunset. We'd been advised to run our motor to let the whales know we were around after dark. We could see the islands from 12 miles off, clearly outlined as the sun went down. By the time we arrived it was getting dark so we inched gingerly into the western-most anchorage, looking for a mooring buoy. It was almost pitch dark with no ambient light apart from the lighthouse - which hindered our night vision. There was a powerboat already in the anchorage and the skipper came out in his dingy to offer advice: there are no longer any moorings but he showed us a good spot to anchor. 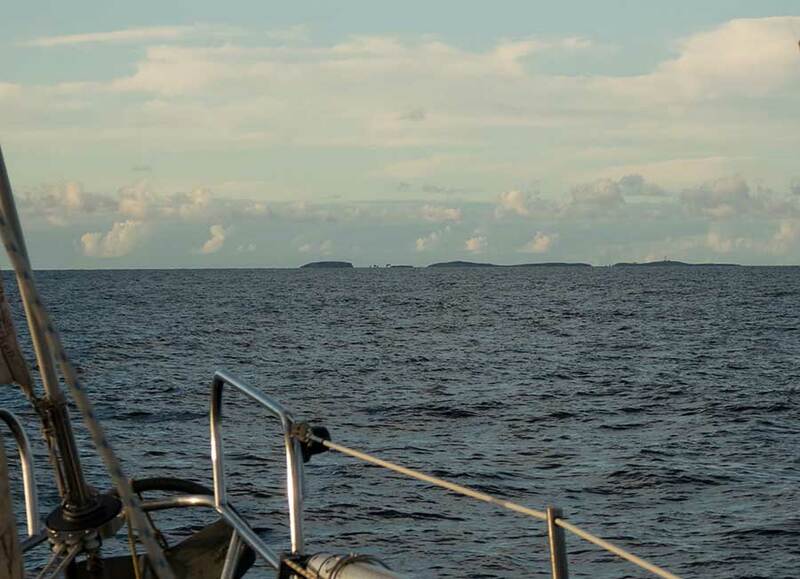 In the morning we woke to the sight of these unassuming but special little islands. We were next to low-lying Siriba, where many seabirds nest, and not far from taller Rotunda, it's cliff face popular with soaring birds. 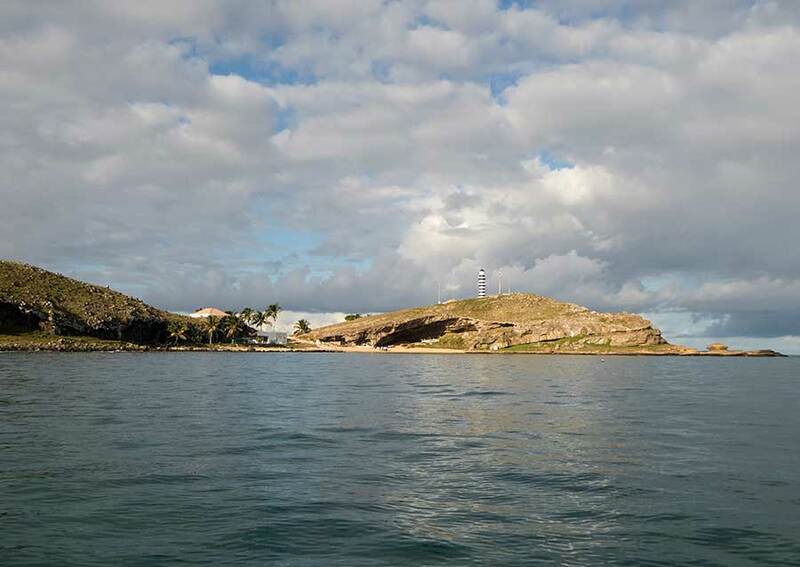 To the east is the larger island of Santa Barbara, with the lighthouse and a small settlement for Brazilian Navy and National Park Rangers. The winds were light, though still easterly, so we decided to move to the main anchorage off Santa Barbara. Here we did find mooring buoys and settled onto one. There were a couple of dive boats milling around, keeping the National Park guides busy, but soon it was our turn for a visit. One of the guides, Laura, spoke good English and explained the rules: we were allowed to snorkel and dive around all but two of the smallest islets; we were not allowed to scrub the bottom or throw any waste - organic or not - overboard; and, we were only allowed to land (escorted) on Ilha Siriba so we arranged a visit for the next day. Laura was also going to ask the Navy to allow us on Santa Barbara to visit the lighthouse. Sometimes they agree, sometimes they don't. I da Santa Barbara, from the buoy; what might those clouds mean? 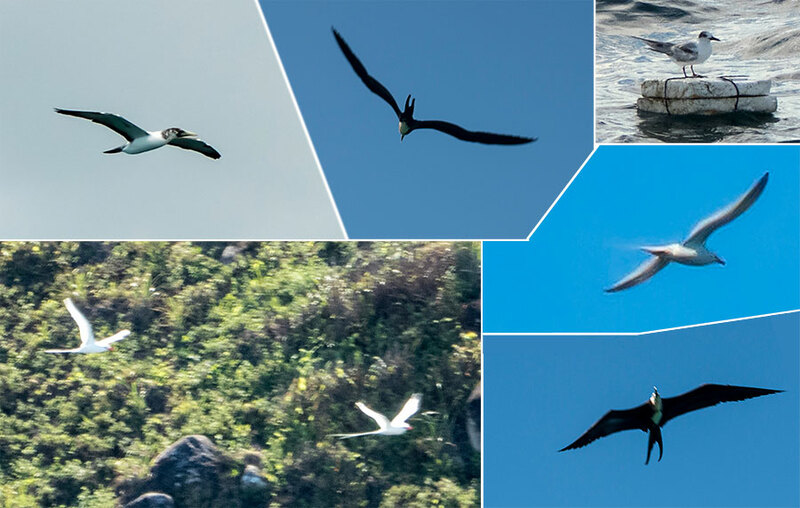 It was a beautiful day for bird-watching: the many frigate birds swooping around were nothing remarkable - we'd seen plenty on the coasts of Sao Paulo and Rio de Janeiro - though some of the markings suggested they were a different type (great or magnificent?) but the red-billed tropic birds were new - flying so fast they are almost impossible to photograph, and noisy. In the afternoon we went snorkelling off the south side of Santa Barbara; the range of reef fishes were the best and biggest we've seen in Brazil. A selection of the bird life, at least the slower flying ones! By late afternoon the wind was picking up again from the east and the anchorage was becoming quite rolly. We stuck it out for the night but in the morning the wind was stronger, the skies were overcast and it was raining. The only consolation was that the stronger wind meant our Rutland wind turbine was keeping our batteries topped up. Being down to just one domestic battery (reserving the other for engine starting) we were having to give the fridge - ever more demanding as we head north into the tropical heat - priority over the computer. Our planned excursion to see the nesting seabirds on Ilha Siriba had to be cancelled as it was too rough to go ashore. We moved back to the anchorage west of Siriba which gives good shelter from the easterlies but is rolly from the swell at high water, when the protecting reef is submerged. The day was very quiet: there were no visiting boats apart from us. The navy and park personnel stayed onshore: they only have small inflatable dinghies. Fishing is banned - and apparently well enforced - because we saw no sign of fishing boats. With no mobile phone masts the islands are blissfully cut off from the rest of the world. We used our satellite connection to check the weather forecast. Much as we'd have liked to stay longer it was telling us to move on. The easterly winds were expected to remain strong for some days - too long for us to sit out in the hope of another spell of calmer weather. We left early the following day and looked back at the islands with a mixture of wonder and regret. What a special place they are, so simple and quiet apart from the squawking birds, too far from the coast to attract hoards of visitors. We were lucky to have just one fine day there - and the wonderful two days of whale-watching on the way. The wind was easterly F5, gusting 6 so we were fine reaching on our way north with one reef in the main and sometimes one in the genoa. Even with a knot of current against us we were making good progress, though bouncing along at an angle in quite heavy seas. Although fairly constant in direction the wind speed was up and down - we were getting squally weather and rainstorms, typical of the tropics - so we needed to keep tweeking the Aries windvane steering to maintain our course: not much time to read! Such is tropical sailing: it was warm enough down below to sleep without any bedclothes; on deck we needed to wear weatherproof gear (sometimes two layers) for protection against the wind, spray and rain. 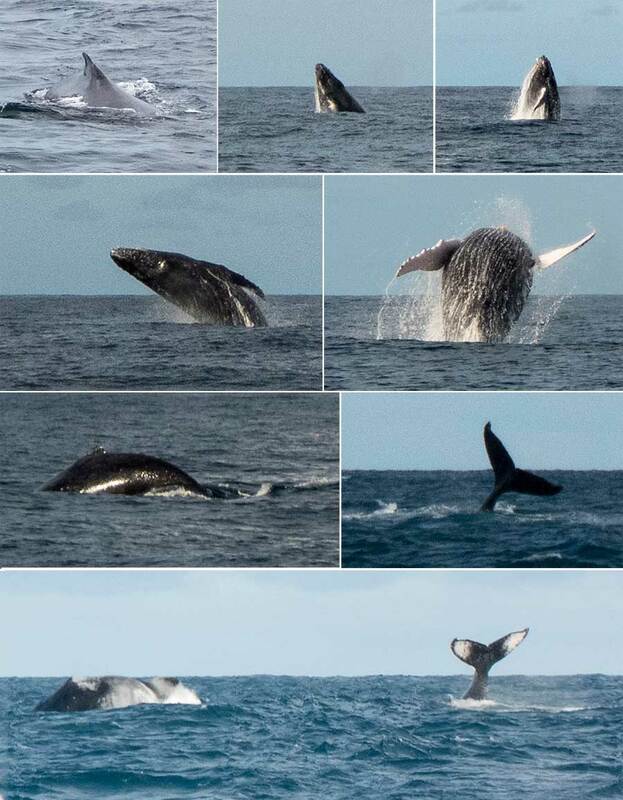 For another 100 miles north of the Abrolhos we saw whales occasionally, though in the stronger winds and heavier seas their antics are less spectacular. We saw little shipping for two days and nights, just the occasional freighter and offshore fishing boats. By the third day the adverse current was down to half a knot and we were hopeful of reaching Salvador before nightfall but in the afternoon the wind dropped. We decided to motorsail in the hope of reaching an anchorage before dark. 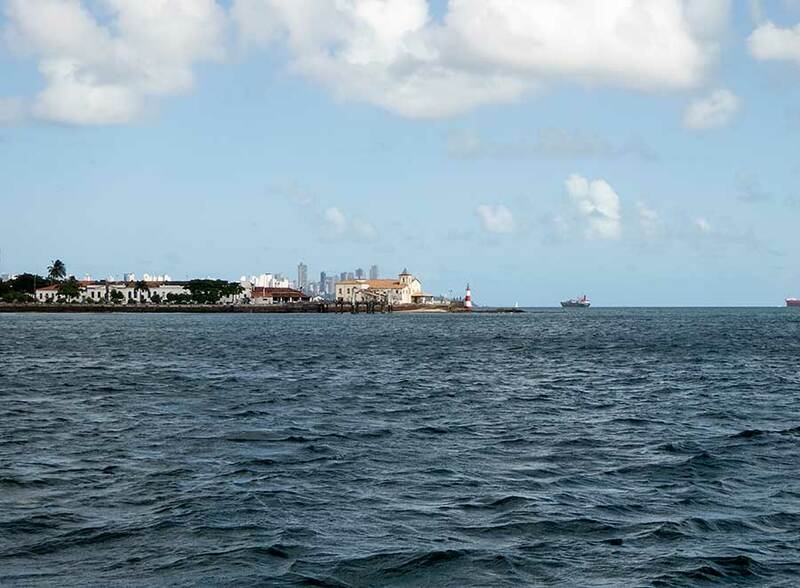 Fortunately the entrance to Salvador and the Bay of All Saints is wide so although there is quite a bit of shipping about, there's room to manoeuvre. Also, since Vitoria we've been suspicious that the AIS is not fully functioning. It's doesn't always pick up ships we can see and sometimes shows them for a while and then loses them. It needs investigation and in the meantime we are back to relying on No 1 eyeball to judge what any particular ship is doing. 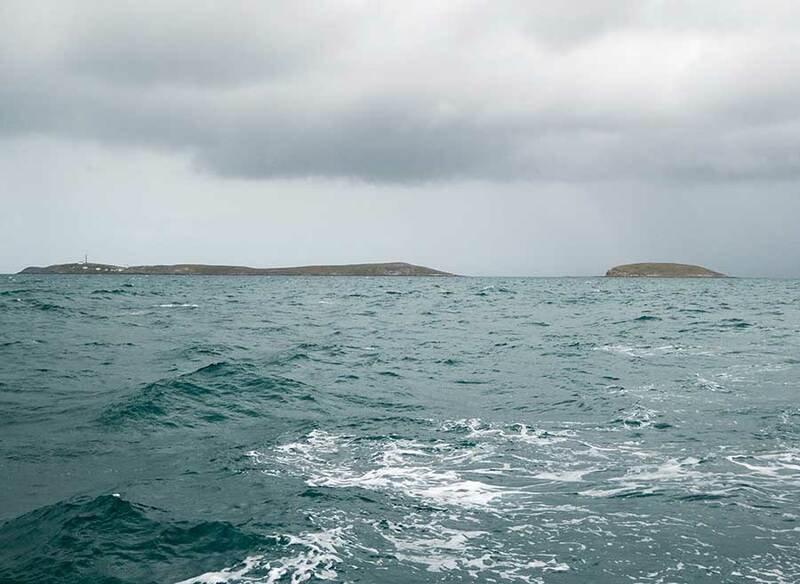 The easterly swell continued through the entrance and as far as the nearest anchorage off a small yacht club. It didn't look very inviting so we continued into the bay, past the main port, through the big ship anchorages and across the ferry route. With so much ambient light it was not difficult to see where we were going and we continued north to the peninsula of Itapagipe where we dropped our anchor in the lee of Forte Monte Serrat, out of the way of shipping. Our intended destination was not far away but there's a sandbar to be crossed, three hours either side of high water, and we'd missed the tide. The next opportunity would be in the early hours but we were comfortable where we were; we caught up on our sleep and waited for the following afternoon tide. It was a Sunday so there were a few local fishermen around us, one curious to know if we were ok and trying to scrounge a beer (not offering us any fish in return). Our response of "Uma cerveja? Nao temos cerveja!" was received with a resigned shrug. In the afternoon we made our way to the narrow passage across the shallow bar, following a carefully plotted course. With both wind and current blowing us off course it's a boon to have gps showing our cross track error. Once into the bay of Ribeira it's just a short distance to Pier Salvador, the comfortable little marina we stayed at in 2013. Sandoval, the owner, had come in to work specially - on a Sunday afternoon - to greet us, with 3 or 4 marineros (a bit of an overkill but much appreciated) to help us into our berth. What more could you ask for? Well actually a freshly-squeezed juice which all new arrivals are presented with here. So here we are, back where we started in Brazil, but 4,860 nautical miles on. Since Vitoria we've covered 534 miles over 7 days with 2 days in the Abrolhos - good going. No wonder we feel like a bit of a rest!